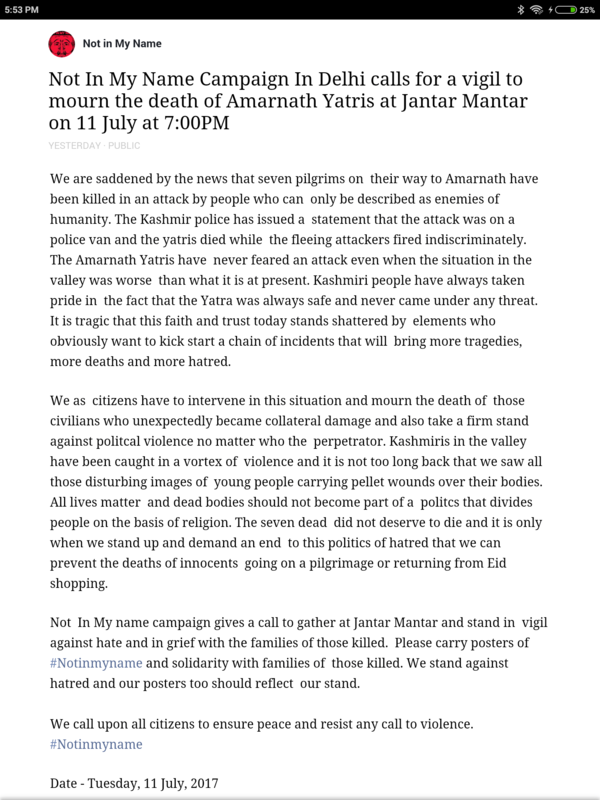 Not in My Name, which started as a movement against mob lynching, has lost all direction today after they have decided to protest “terrorist” attack on Amarnath pilgrims. 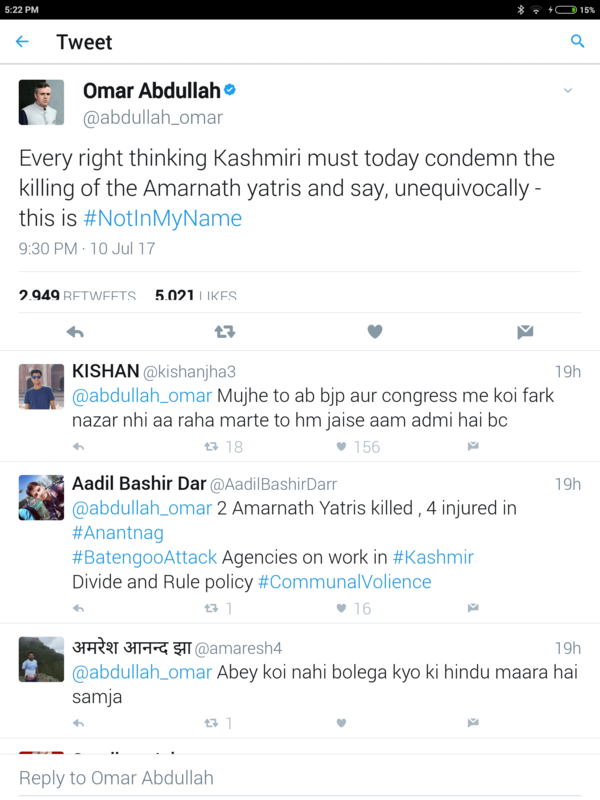 From what I can gather on Twitter, Omar Abdullah was the first one to use the hashtag #NotInMyName in connection with the Amarnath Attack. He used it in the context of Kashmiris and urged them to condemn the attack, which is fine if an assumption is made that the attack was carried out by the militants in the name of Kashmiris — though it’s a different matter that LeT is now claiming that the attack was carried out by Indian State through its forces to garner support as a last resort. The tweet screenshot is enclosed below. Now comes the twist in the tale. 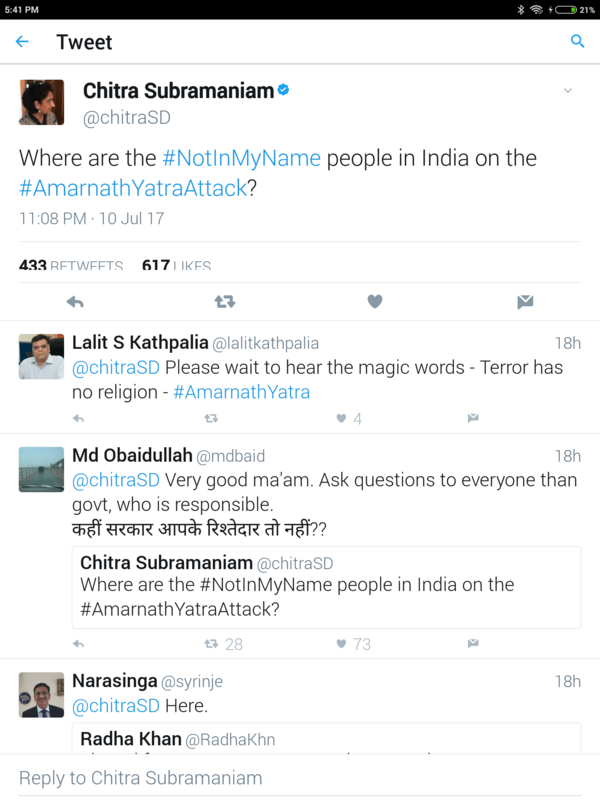 Some Chitra Subramanian tweets questioning the #NotInMyName brigade on their silence on the Amarnath Attack. This tweet was premature and a complete nonsense unless it is presumed that the Kashmiri militants were killing in the name of #NotInMyName brigade. The tweet screenshot is enclosed below. I don’t know why so many people jumped in to answer this tweet as if it was some tweet of the moment. And the next morning I saw a tweet from @NotInMyNameIn calling for protest against the killings. I don’t know whether they were impressed by the tweet of Omar Abdullah or were retorting to the tweet of Chitra Subramaniam, but whatever it is, it is the most thoughtless action. Just for record, as at 6.00 PM today, @NotInMyNameIn is following only one politician on Twitter, who is Omar Abdullah. @NotInMyNameIn also have a Facebook account, where they have posted the reason for calling this protest. The post screenshot is also enclosed below. From the post, it is clear that they are calling the situation in Kashmir as a politics of hatred being practiced in the name of religion from both the sides, i.e. Hindu India represented by Indian security forces and the Muslim Kashmir represented by Kashmiri militants. They have called the loss of lives of innocent pilgrims as a collateral damage between the warring forces. Collateral damage is a word which has a specific meaning in a military context; i.e., loss of civilian lives while attacking military targets; which probably can’t be used in the present context of Kashmir, but since I have a weak vocabulary, I am using the same terminology and calling this loss of lives as a collateral damage. I have two issues with this protest. First, since this is a collateral damage, the activists shouldn’t be protesting against it under the banner #NotInMyName, for the issue is clearly strategic, where their vigils won’t serve any purpose. Secondly, personally I am an #AntiNationalHumanist and don’t associate with the State forces (Hindu or secular), so they just can’t kill in my name; and also since I am not aligned to the Kashmiri separatist cause, the militants also can’t kill in my name. I am following the twitter handle @NotInMyNameIn. 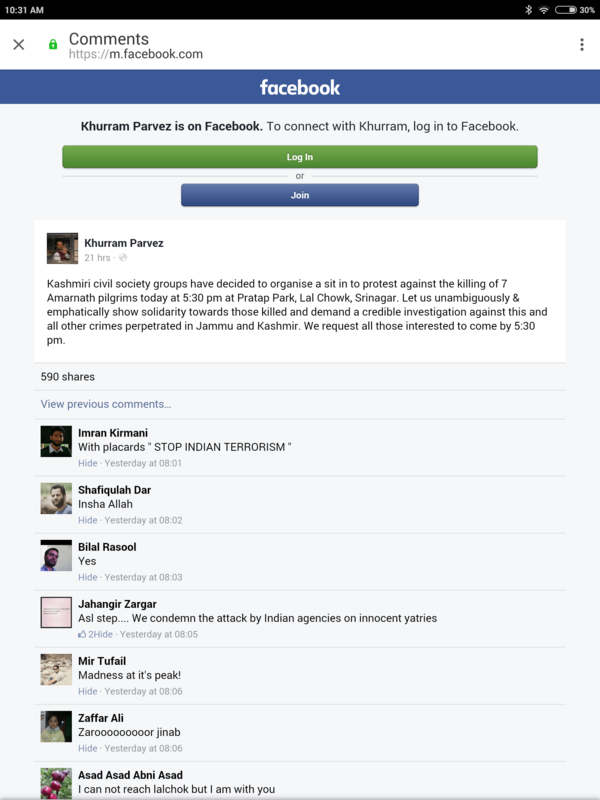 I received a tweet from them in my timeline urging people to organize for a protest at Jantar Mantar today at 7 PM. It is already 6.30 PM and by the time I will finish this post, it would cross 7 PM, so obviously I won’t go there even out of curiosity. Even otherwise, I think people are over-reacting to these killings. Till now I had a grouse that Indian media goes overboard if there are even minor “terrorist” attacks in Europe or the US, but, ironically, today after seeing similar reactions with respect to the Amarnath Attack, I am rather worried whether this is because the pilgrims were Gujaratis. I have no qualms naming a specific region because, as per a PTI report, “top govt. sources” took this name, so it’s official. If my doubts are correct, it is a serious cause of worry because then these activists are proving themselves to be very poor proxies of the politicians by organising this protest at Jantar Mantar today. I had not given much credence to LeT in my above post. But what if they are speaking the truth! Then it would mean that the sit-in protest in Kashmir yesterday helped Indian State’s agenda to divert Kashmiri support to Kashmiri separatists. Though I don’t think the Indian State succeeded in it because those sitting in sit-in protest pretty much believed LeT and sat in protest against the Indian State forces more and the militants less. Check the screenshot below. However, the role of Omar Abdullah becomes suspicious if LeT is indeed speaking the truth. It is well-known that Kashmiri mainstream politicians are nothing but Indian stooges. So, was Omar Abdullah acting under the directions of the Indian State all day yesterday? I think the activists should just keep away from politicians as a rule because they can never know when a politician would enter into what filthy deal with whom as they have no access to the intelligence machinery of the State. Be the first to comment on "Amarnath Attack: Not In My Name in India Has Lost Direction"